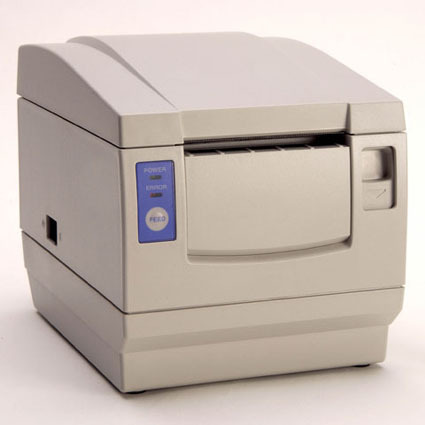 Citizen´s CBM1000II receipt printer is a great choice for any point-of-sale application. The CBM1000II is known for its front-exit printing with spill resistant top, allowing for reliable and versatile printing. Featuring drop-and-load paper, flash memory, and a print speed of 150mm/second, the CBM1000II can meet the challenge of tough hospitality environments. It also features a compact footprint and is lightweight; perfect for small spaces. Available in White, Black and Charcoal Grey. Font Size: Font A - 0.05" x 0.12" : Font B - 0.35" x 0.12"
Dimension (WxDxH): 5.71" x 7.48" x 6.18"